Primer+ Hydration is the first step to porcelain perfect skin and the perfect base for all makeup. Primer Plus+ Hydration blurs out fine lines, pores and imperfections and give skin cells a new lease of life. Primer+ is more than a primer. It contains snow algae to safeguard skin youthfulness – snow algae is an active and anti-aging skincare ingredient typically found in snowy alpine regions and key to skin longevity. 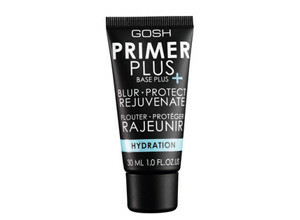 Primer Plus+ works at cellular level to rejuvenate and protect and delivers immediate hydration. I’ve been using this primer every day for about 2 weeks now. I think the packaging is very cute, and hygienic. The white creamy liquid has no noticeable scent and does not irritate my skin or cause breakouts whatsoever. It certainly holds up to the expectations of a “hydrating” primer, and makes my skin look healthy and glowing under any type of foundation (cream, liquid or powder). In terms of its efficacy; foundations that oxidise on my skin without primer, did not oxidise when I applied this primer first, so it definitely does prime the skin from that perspective. I was however not convinced by its claim to “blur imperfections”, as I have had better results from other primers for this specific task. I think it is suited to all skin types, but I think people with dry skin will really love this product. All in all I will definitely continue using this product and I think my skin will love this primer in Winter. Been using it for a few months. The one with the beads.it has a low glitter content so its great day and night for flawless skin. Applied with Body Shop body brush as I prefer the longer bristles for a more even application.